Bobby Greenwood, longtime golf professional and Cookeville native, received the Tennessee PGA Distinguished Career Award last week at the Golf House of Tennessee near Franklin, where the award was unveiled. The Distinguised Career Award is the highest honor the Tennessee PGA can bestow upon a golf professional. It recognizes current or former Tennessee PGA Section members who have had outstanding careers as PGA Professionals based on service to their club, course or employer, service and leadership to the association, community service, professional playing record and teaching ability. The Distinguished Career Award acknowledges these Tennessee PGA Professionals as vital and significant contributors to the game of golf. 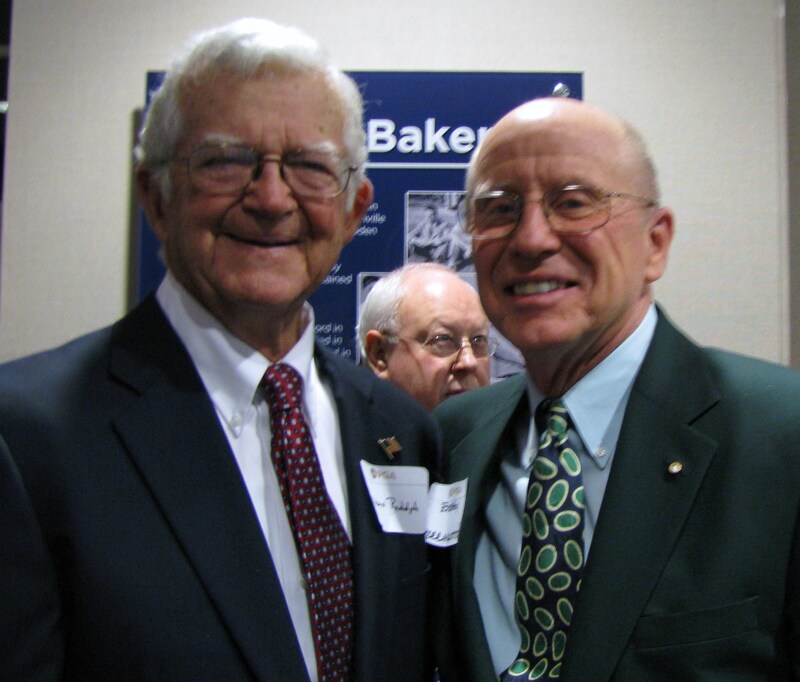 Greenwood and fellow members of the Tennessee Golf Hall of Fame – Pat Abbott, Cotton Berrier, Joe Campbell, Harold Elller, Gibby Gilbert, Lou Graham, Don Malarkey, Cary Middlecoff, Teddy Rhodes, Loren Roberts and Mason Rudolph, who were also received the Distinguished Service Award, according to Buddy Pearson of the Herald-Citizen. Greenwood joins an elite group of only 26 other PGA Professionals who have received this honor. 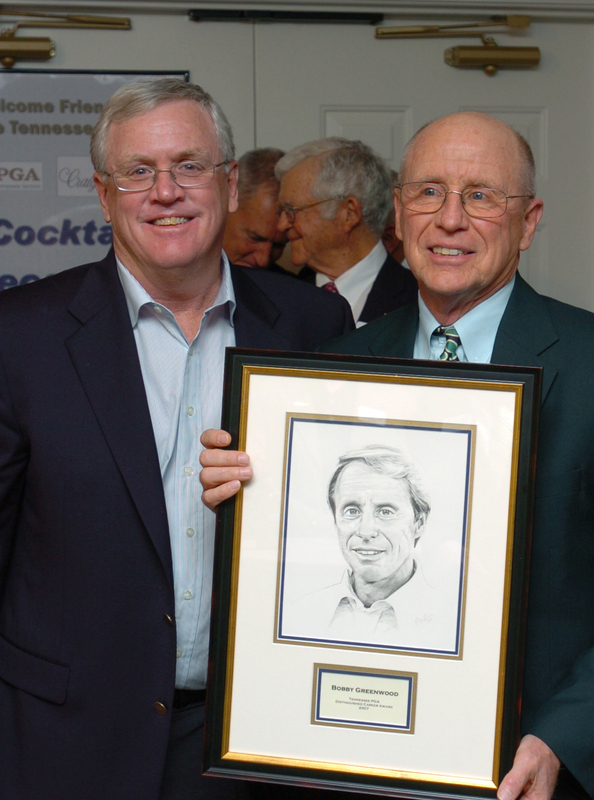 Photo caption: Tennessee PGA president Hunt Gilliland, left, presents the Tennessee PGA’s Distinugished Career Award to former PGA Tour player Bobby Greenwood. The Cookeville native was introduced to golf at the Cookeville Country Club at the age of 12, according to the Tennessee Section of the PGA. After earning a three-time NCAA All-American career at North Texas State University, Greenwood was noted as one of the best amateurs in the country during the 1960s. He was twice ranked in the Top 10 Amateur golfers in America by Golf Magazine. Greenwood won the 1966 Tennessee State Amateur and the 1968 Tennessee State Open, and played the PGA Tour from 1969 to 1975 carding six top 10s and fifteen top 25s, while also winning the 1970 Rhode Island Open while on the Tour. He played in two US Opens, eight Tennessee Cup Match Teams and currently is the President of his own golf course architectural firm in Cookeville. Greenwood is also a member of the University of North Texas Sports Hall of Fame, Tennessee Golf Hall of Fame and Riverside Military Centennial All-Sports Hall of Fame. Greenwood was one of fifteen past and current recipients who were on hand for this special unveiling in Franklin, Tennessee in front of their fellow Tennessee PGA Professionals and special guests. Photo caption: There was a special greeting of two old PGA Tour players, Mason Rudolph, left, and Bobby Greenwood at Golf House of Tennessee last week, when Greenwood received his Distinguished Career Award. The Tennessee PGA has just notified Bobby that he will retroactively be awarded the TN PGA Distinguished Career Award along with the other Former PGA Tour players; Mason Rudolph, Lou Graham, Gibby Gilbert, Joe Campbell and Loren Roberts. The Distinguished Career Award presentation will take place on Sunday, February 28th and March 1st, 2010 at the TN PGA annual meeting. Flash Report: Greenwood to be inducted into the Tennessee Golf Hall of Fame! The Tennessee Golf Hall of Fame has four new members. Former PGA Tour golfer Bobby Greenwood of Cookeville is a new inductee. Also, longtime amateur and PGA Tour golfer Joe Campbell, who made his home in Knoxville but now lives in Indiana, joins Cleveland native Connie Day, long recognized as one of the state’s top amateurs. Ann Baker Furrow, who competed on the men’s team at Tennessee in 1964 and 1965, will be inducted. She was a five-time Tennessee Women’s Amateur champion and placed second in the 1962 USGA Amateur Championship.